Terms and conditions and client agreements both have an important place in your startup. Knowing when to use each can help you can set clear expectations for your customers when they work with you. So, terms and conditions - what are they? Your terms and conditions are the rules that your prospective or actual customers have to abide by to either use your products or even access your website. Really, you can have terms and conditions that deal with any aspect of your business. We're dealing with the most common type in this article - website and product terms and conditions. So why do you need terms and conditions? To avoid any legal trouble, it's important to make sure that people know what to expect before they do business with you. What usually goes into terms and conditions? suspension or termination - acceptable use policies. Where should I display the terms and conditions? You can display terms and conditions anywhere. Popular places to display terms and conditions include your website, app, software and as attachments to invoices (soft and hard copies). A golden tip - always display your terms and conditions so your customers can see them before they make a purchase. Display your terms and conditions so that customers can see them before they make a purchase. Why prepare a client agreement? A client agreement can be customised for a customer's needs. You can customise pricing, delivery terms and other aspects of your offering. Use terms and conditions when your rules won't vary between your customers. For example, if you were selling low value goods online and the same rules apply to everyone purchasing. 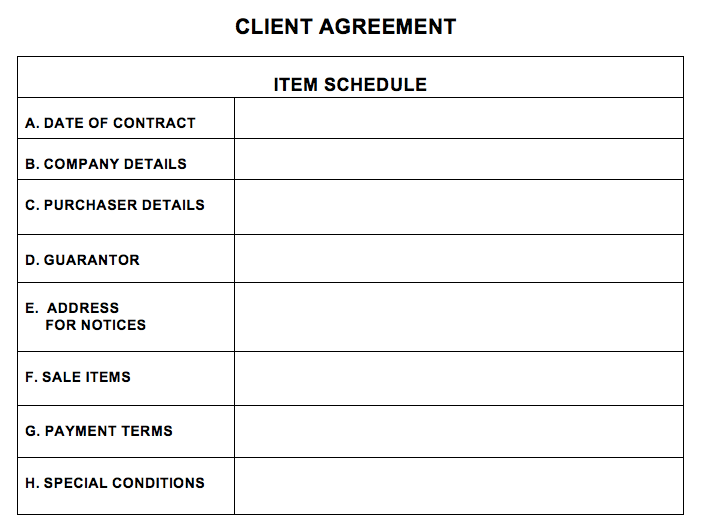 You can use a client agreement for more complicated product sales, where terms are likely to vary between your customers. For example, instances where you may offer different conditions for a purchase or a volume discount to various purchasers. Should you choose terms and conditions OR a client agreement only? If your product is straight forward and available to all your customers on the same terms, you probably won’t need a client agreement, and terms and conditions will be enough. For example, t-shirts or beauty products sold online. If your product is more complicated, you may opt for terms and conditions and a client agreement. For example, professional services such as consultancy. I’ve seen it a lot in my line of work that T’s & C’s get copy/pasted by a competitor. Only recently I’m seeing that these are being more closely inspected by not only customers but Facebook and other service/subscription providers that are essential for startups. While the cost of terms and conditions to be drawn up by a lawyer tends to be looked at as a bit of a waste of startup capital. As a digital marketer working with startup businesses through our Business Startup Package (https://3amideas.com.au/services/business-startup/) I can only recommend getting T’s & C’s done up by a professional lawyer and staying away from plagiarism.